Performance “Kadmo the King”, premierly performed on this years festival Budva- grad teatar, doesn’t belong to traditional theatre. Dramaturgical basic of Marko Kentera containes material about origin of city Budva, so as the myths and legends related to its foundation. Crucial factor for social transormation was Greece, because of the cultural and political influence. Using archetipes of ancestors, ethnic rituals and customs from the times of Enheleyans and arrival of Kadmo from Thebes, Nela Antonovic made ritual choreodrama. The first part is about establishing Thebes in Greece, and the second part is related to the foundation of Budva. “On a full trace between churches and on the ground of ancient Basilic “Kadmo the King”, complex ambiental choreodrama was performed. 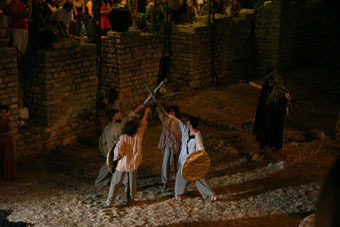 In exciting story, based on legends and myths related to foundation of Budva, archetypes of ancestors, ethnic rituals and arrival of Kadmo from Thebes, you could see juggling, fire-works, soldiers, muses, dance with fire, Delphy dancer.